Denis Uonhi (also Green and O'Sullivan) is my 3rd great grandfather. He was born around 1810 and lived in Ballydonegan, County Cork, Ireland. His wife, Margaret Lowney (1815-1865), was my 3rd great grandmother. Ballydonegan is located in the townland of Allihies, County Cork, on the south western coast of Ireland. By all accounts it is a beautiful area and is going on my bucket list of places to visit. Here are a couple of photographs of the countyside and coastline near Ballydonegan Bay. View over Allihies. Ballydonegan Bay is on the left. This next photo was included in a blog I discovered, GaiaInAction.blog. "Making a journey on the Beara peninsula in the South West of County Cork here in Ireland, is lovely any time of the year. Fresh air is always available, plenty of it. The coastal road gives magnificent views after every single bend. Here are some photos of one particular area, Ballydonegan bay, where Knocknagallaun hill and Eagle Hill make the landscape real interesting and beautiful with a wildness all of it’s own." I was lucky enough to stumble on this genealogical information when I became aware of Riobard O'Dwyer's three volume tome, The Annals of Beara. O'Dwyer is an Irish genealogist whose knowledge of County Cork, Ireland genealogy (specifically the Beara Peninsula) is comprehensively stunning in scope and detail. It's truly outstanding. On Page 397 of Volume I there is an entry for Denis Uonhi and Margaret Lowney, detailing their children. Not much is known about Denis himself other than that he was a tailor and his father was Eugene Uonhi (my 4th great grandfather). 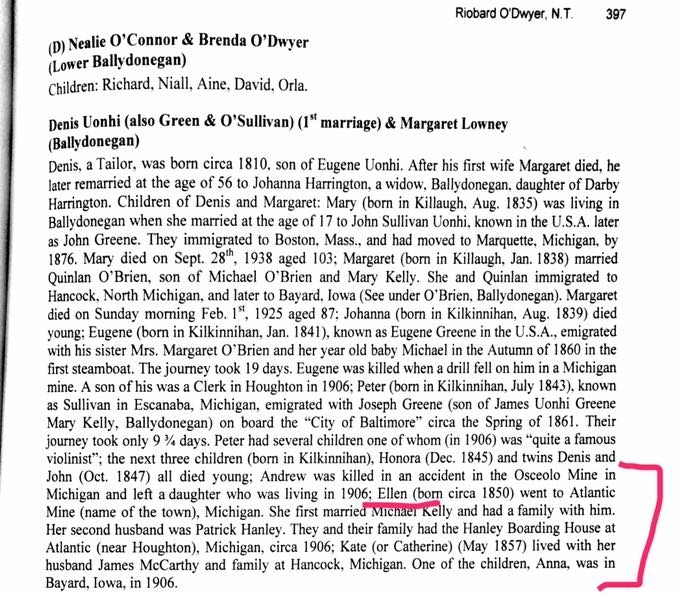 The highlighted section talks about one of their daughters, Ellen. She was my 2nd great grandmother, Ellen Sullivan/Green. She was born in 1850 and died in 1938, as confirmed by the death certificate I obtained for her. She was also the mother (with her first husband, Michael Kelly) of the "Blind Cornelius Kelly" I have blogged about in the past. With her second husband, Patrick Hanley (1857-1923) , Ellen had Michael Hanley (1890-1964), my great grandfather. O'Dwyer, a native of County Cork, Ireland, spent several decades documenting all the families in the area where some of my ancestors came from. Literally ALL of them. If there was a document about them, he found it. Without the detail about the "Hanley Boarding House" in Atlantic (Mine), Michigan I would not have been able to make this connection. If you spend any amount of time looking through O'Dwyer's writings you will soon become overwhelmed. There are THOUSANDS of similar first and last names that make identifying any specific family with certainty quite challenging (e.g., Sullivans, Harringtons, Hanleys, O'Sheas ...). And don't get me started on the first names (e.g., Michaels, Johns, Margarets, Patricks...)! There is not an easy way to search through these books. For a fee you can have access to digital versions of these books at American Ancestors. Unfortunately, however, only Volume I is indexed and searchable. You can only get access to images of Volume II and III. I have all three volumes in print and, in some instances, it is like pouring over a phone book - not the most riveting, but the potential for surprise and accidental discovery is ever present! You can check out the other books I have available for inquiries at The Psychogenealogist Library. These books are a real special find for me. They've opened up many more avenues of genealogical inquiry to pursue. Lastly, here is a special treat - a flyover video showcasing this beautiful part of the world. Enjoy! This is the 25th of 52 weekly posts planned for 2018. It was inspired by the #52Ancestors writing challenge issued by professional genealogist, Amy Crow Johnson. The challenge: once a week, for all 52 weeks of the year, write about a relative in your family tree. In 1936, Leo Marcus Amen (1912-1994), a Nebraskan farmer, was faced with the unenviable task of using a jackknife to amputate his own finger that had become caught in a plow. He is my 3rd cousin 2x removed. This is his story. Blind from a mining accident in Ireland, Padraig Hanley (abt. 1810) was my 4th great grandfather. This is his story. In 1971 my grandparents took a trip to Ireland. Blarney was one of their many stops in County Cork and adjoining areas. I just love this photo of a horse drawn Blarney Romany Caravan they saw along the way. Born around 1810 Denis Uonhi (also Green and O'Sullivan) is my 3rd great grandfather. He made his family home in beautiful Ballydonegan, County Cork, Ireland. This is his story. Quin A. Ryan (1898-1978) is the most famous relative I’ve written about so far. He was a Chicago native and broadcasting legend. He is also my 2nd cousin 2x removed. Here is his story. Whether praying in the pews or tending the family bar, John "Jack" Hanley (1885-1946) was a man of faith and familial duty. This is his story. Though likely not THE train that killed my 2nd great uncle, James Hanley (1888-1909), one like it from the same railroad company probably did. This is his story. Patrick Hanley (1887-1937) is my 2nd great uncle. By all accounts he was a quiet and well liked man. This is his story, with a first hand audio account from people who knew him. Have you ever opened a tattered shoebox of old family photographs? Or discovered a sepia toned image poking out the back of the family bible that has been tucked away in your attic for decades? Newer PostThe Halvangis Family at Evergreen Cemetery in Detroit, MI.